Premium Charcoal BBQ in Black This Heavy-Duty Premium Charcoal BBQ in Black from Dyna-Glo offers everything you need to enhance your outdoor cooking experience. With a total cooking space of 816 sq. inch and easily accessible and adjustable charcoal tray, you can achieve that classic smoky taste with ease every time you barbecue. The stainless smoke stack features an adjustable flue for fine tuning temperature control, and the heavy-duty porcelain enamelled cast iron cooking grates retain heat to sear foods and lock in their natural juices. This grill features a temperature gauge so that you can easily monitor your heat level and maximize your cook performance. The 3-Piece sliding cooking grates offer easy access to charcoal during the cooking process, and the heavy-duty cast iron charcoal access door helps to retain heat for optimal fuel efficiency. With a bottle opener on the front of the grill, you can keep the party going as long as you want with your Dyna-Glo Premium Charcoal Grill. Premium Charcoal BBQ in Black is rated 4.4 out of 5 by 106. Rated 5 out of 5 by Jrobi from It was easy to put together. I love the cast iron grates, I looked all over for a charcoal grill ... It was easy to put together. I love the cast iron grates, I looked all over for a charcoal grill with cast iron grates. It seemed they only came in gas grills until I found the Dyna-Glo. It's big enough to be able to use it as a smoker too. I've had gas grills in the past and I really prefer charcoal grills. Rated 5 out of 5 by Nina from Love the grill. Well built and easy to... Love the grill. Well built and easy to put together, even by yourself. Cooks everything good and plenty of room for steaks and vegetables. Only thing missing is a place to hang your BBQ tools. Rated 5 out of 5 by MarkO from The grill was relatively easy to put together.....approximately an hour or so. Very easy to clean... The grill was relatively easy to put together.....approximately an hour or so. Very easy to clean the ashes with the removable tray and great temperature control with the adjustable charcoal rack. Rated 4 out of 5 by Jerry from When I received delivery of the grill I was impressed... When I received delivery of the grill I was impressed by it's heft even though I understood the weight to be greater than 100lbs. Upon taking inventory of the box I was again impressed by the quality of the parts and the instructions for putting the grill together. BTW it took more that the 50minutes as stated; more like two hours, but it went together perfectly and yes with assistance toward the end. I really like this grill and look forward to using it for many years to come. The only short coming is that I would have liked a grate lifter although with the offset grate placement and ability to slide them most people would not need one. 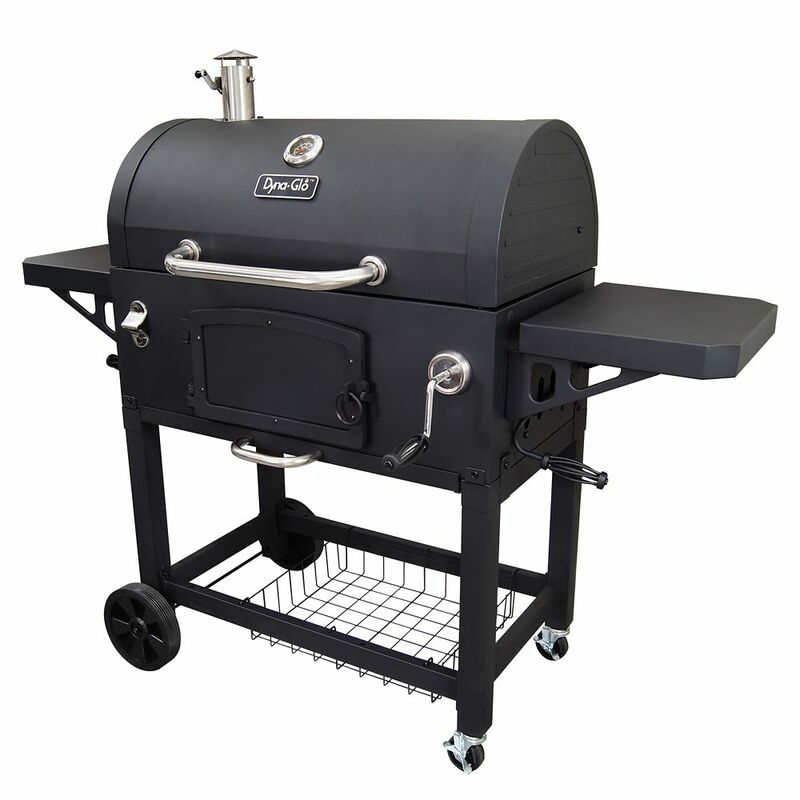 This is a high quality, heavy duty grill, even smoking is easy to do by varying the vents and stove pipe. Rated 4 out of 5 by TheHub from Very happy with this grill. And that is what I... Very happy with this grill. And that is what I got it for, grilling, Does great with burgers, steaks, chicken, etc. Not too sure about smoking as the unit is not very tight fitting. Well made, solid construction and I hope well last for many years.